(1) Where it appears to the proper officer that any tax has not been paid or short paid or erroneously refunded, or where input tax credit has been wrongly availed or utilised for any reason, other than the reason of fraud or any willful-misstatement or suppression of facts to evade tax, he shall serve notice on the person chargeable with tax which has not been so paid or which has been so short paid or to whom the refund has erroneously been made, or who has wrongly availed or utilised input tax credit, requiring him to show cause as to why he should not pay the amount specified in the notice along with interest payable thereon under section 50 and a penalty leviable under the provisions of this Act or the rules made thereunder. (2) The proper officer shall issue the notice under sub-section (1) at least three months prior to the time limit specified in sub-section (10) for issuance of order. (8) Where any person chargeable with tax under sub-section (1) or sub-section (3) pays the said tax along with interest payable under section 50 within thirty days of issue of show cause notice, no penalty shall be payable and all proceedings in respect of the said notice shall be deemed to be concluded. (9) The proper officer shall, after considering the representation, if any, made by person chargeable with tax, determine the amount of tax, interest and a penalty equivalent to ten per cent. of tax or ten thousand rupees, whichever is higher, due from such person and issue an order. (10) The proper officer shall issue the order under sub-section (9) within three years from the due date for furnishing of annual return for the financial year to which the tax not paid or short paid or input tax credit wrongly availed or utilised relates to or within three years from the date of erroneous refund. (11) Notwithstanding anything contained in sub-section (6) or sub-section (8), penalty under sub-section (9) shall be payable where any amount of self-assessed tax or any amount collected as tax has not been paid within a period of thirty days from the due date of payment of such tax. Chapter XV of the CGST Act,2017 covers twelve sections relating to DEMANDS & RECOVERY under GST. 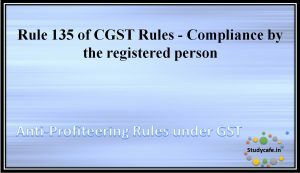 All these sections from the CGST Act,2017 are available for your ready reference. Voluntary Registration can now be cancelled before completion of one year! A dealer while filing the GSTR 3B, due to clerical error, taken ITC worth Rs. 1100000/- instead of 110000/-. The mistake came to notice after 3 months and the dealer reversed the ITC voluntarily. During all the three months he never utilized this amount i.e. the amount taken wrongly as ITC and the ITC remains more than 1000000/-. In this situation whether Interest under section 50(1) is chargeable on the un-utilised amount wrongly taken in ITC and reversed voluntarily for the period of 3 months.